As you know my name is Stefan (stef-in not stef-on) and I love to build complex things that are simple to use. I spend a lot of my time developing and designing web products that look great on all of your devices. Enough talk, Lets take a scroll! Our friends at Young Lions recently made the decision to merge their companies and rebrand as Young Offenders. This called for a newly designed site that I was asked to develop and consult on. 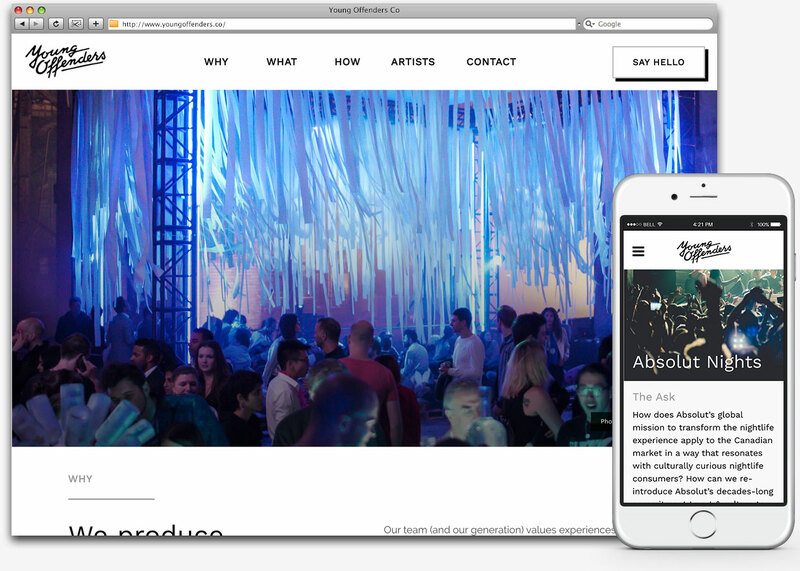 The site needed to be responsive, easily updatable and feel alive through the use of animation. We decided to build the site on Wordpress because of its familiarity and ease of use. I built a custom responsive theme based on the provided designs, and designed several animations to deliver a more delightful experience. I made use of things like sticky navigation bars, content tile roll overs, and carefully timed opacity fades between menu's. This is overall one of my favourite sites to date. In their own words "Young Lions Music Club is a leading music & creative services hub which creates connections between artists, brands, and audiences". Young Lions approached me to breath some new life into their website visually, and also bring them onto a platform that allows easy updates to the sites content. 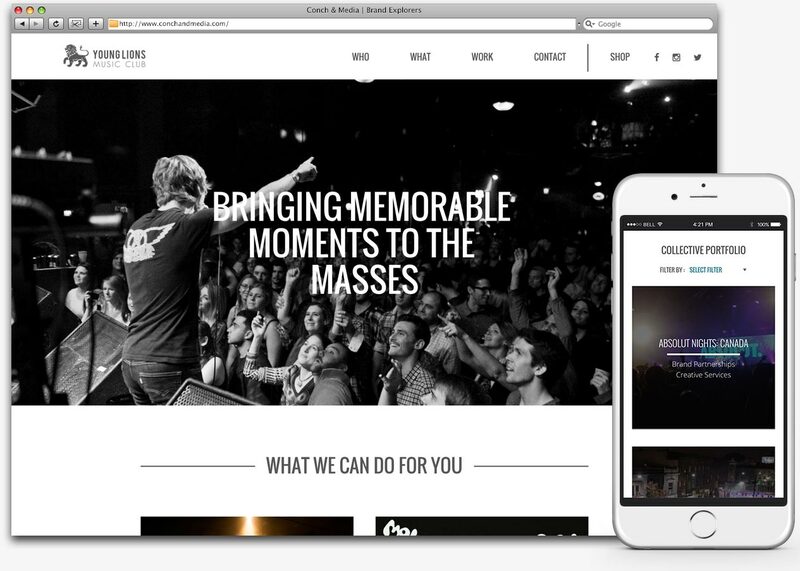 They were very intent on having a clean & simple site that could showcase the photography from their live music events, give information on the artists they manage, showcase their portfolio, and educate potential clients on the service's they offer. I designed the site to use large full-width hero images, a simple grid based responsive layout, subtle hover effects, and easy to read type. This was all built on top of WordPress to give them an easy-to-use , but flexible content management system. The site was designed in Adobe Creative Suite and developed using WordPress, PHP, HTML5, CSS3, jQuery. 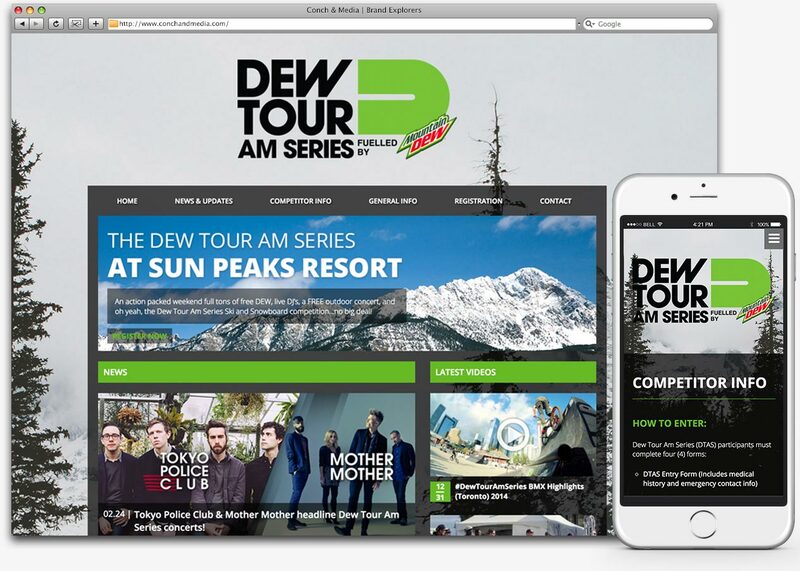 Mountain Dew is a big player in Action Sports and holds an annual Ski & Snowboard competition at Sun Peaks Resort in BC. Their website serves as the main gateway for competitors to register for the event, making it critical to the success of the competition. The site was dated aesthetically and lacking functionality. I was hired to create a clean responsive design, as well as, oversee the development of the new site. I came up with a simple design that allowed quick access to registration and other event information to remove friction for users. Under my advisement it was built on WordPress to allow easy tracking of registrations, quick updates to news, and extendable functionality through plugins. The site was designed in Adobe Create suite and developed using WordPress with custom plugins, PHP, HTML5, CSS3, jQuery. 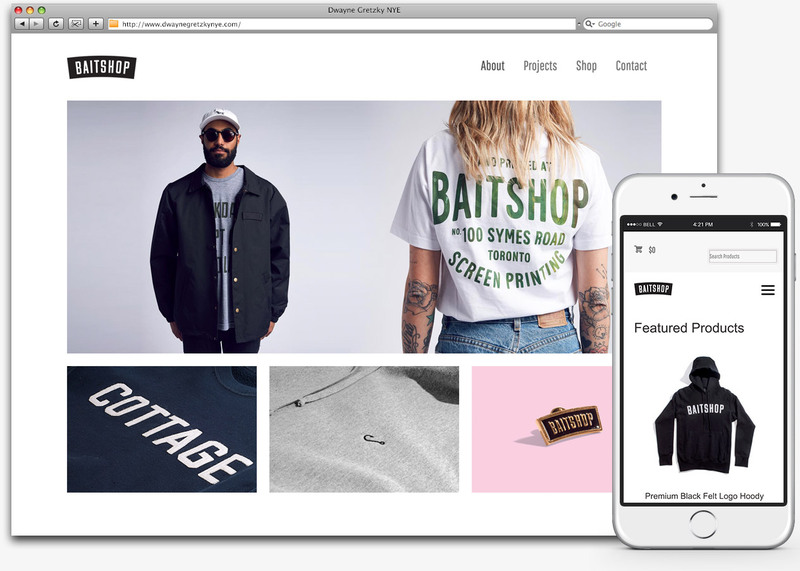 The Baitshop consists of many layers: A clothing line, print company, event space, and retail store. The goal of new website is to showcase the latest content from each of these layers and allow customers to easily order garments directly. I designed a simple responsive grid layout that allowed the content to be the center of attention. Media is presented through image sliders that support embedded video and feature a custom coded "Theater Mode" during video playback. For the eCommerce portion of the site I incorporated a popular shopping cart plugin and customized an existing responsive WordPress Theme. The site was developed using HTML5, CSS3, jQuery, WordPress, WooCommerce, Flexslider, and Isotope. 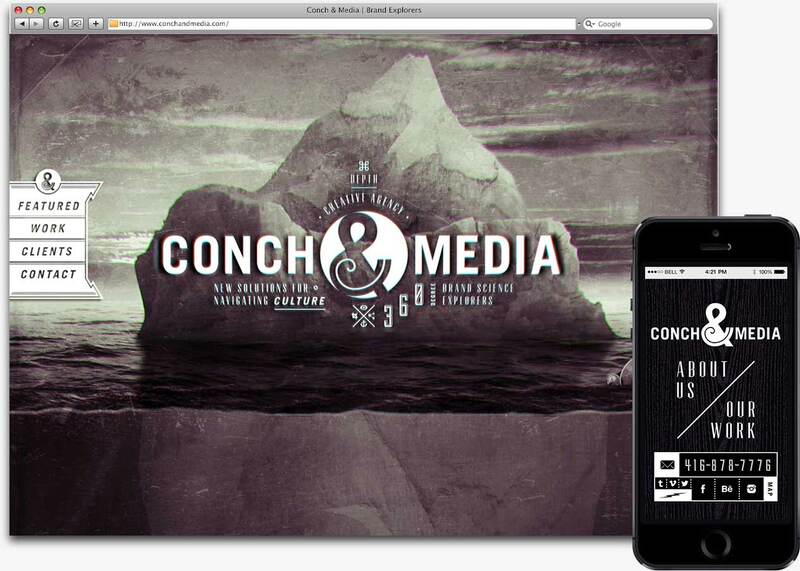 Conch & Media is a start up creative agency based in Toronto. As a creative agency they wanted to build a website that stood out from the crowd and offered a highly immersive experience. In addition to the desktop site a mobile version that delivered the same content in a mobile friendly manner was needed. Sticking with the aquatic theme of the brand, I created an interactive parallax site that takes users on a deep-sea exploration. The parallax scrolling proved to be highly effective and delivered the immersive experience they were aiming for. The site was developed using HTML5, CSS3, jQuery, Parallax Scrolling, scrollTo, and JWplayer.